The Alabama Coalition for Responsible Tobacco Retailing consists of the Alabama Grocers Association, Alabama Association of Convenience Stores/Alabama Oilmen’s Association, Alabama Wholesale Distributors, Petroleum and Convenience Marketers of Alabama, Alabama Tobacco and Candy Distributors Association, and Alabama Retail Association. The We Card program is supported by the Alaska Cabaret, Hotel, Retailers and Restaurant Association and the Alaska Restaurant and Beverage Association. The Arizona Coalition for Responsible Tobacco Retailing consists of Arizona Candy and Tobacco Association, Arizona Food Marketing Alliance, Arizona Lodging & Tourism Association, Arizona Licensed Beverage Association, Arizona Petroleum Marketers Association, Arizona Restaurant and Hospitality Association, Arizona Retailers Association, and The Arizona Smoke Free Business Alliance. The Arkansas Coalition for Responsible Tobacco Retailing consists of the Arkansas Oil Marketers Association, Arkansas Grocers and Retail Merchants and Arkansas Wholesale Marketers Association. The California Coalition for Responsible Tobacco Retailing consists of the California Grocers Association, California Independent Oil Marketers Association, California Grocers Association, California Independent Grocers Association, California Distributors Association, California Beverage Retailers Association, California Retailers Association, and Neighborhood Market Association. The Colorado Coalition for Responsible Tobacco Retailing consists of the Colorado Retail Council, Colorado/Wyoming Petroleum Marketers Association, Rocky Mountain Food Industry Association and the Colorado Association of Distributors. The Connecticut Coalition for Responsible Tobacco Retailing consists of the Connecticut Food Association, New England Convenience Store Association & Energy Marketers Association, Independent Connecticut Petroleum Association, Connecticut Retail Merchants Association and the Gasoline and Automotive Service Dealers of America. The Delaware Coalition for Responsible Retailing consists of the Delaware Food Industry Council and the Washington, Maryland, Delaware Service Station and Automotive Repair Association. The Florida Coalition for Responsible Tobacco Retailing consists of the Florida Petroleum Council, Florida Petroleum Marketers and Convenience Store Association, Florida Retail Federation, and the Florida Tobacco & Candy Association. The Georgia Coalition for Responsible Tobacco Retailing consists of the Georgia Food Industry Association, Georgia Association of Convenience Stores, Georgia Oilmen’s Association, and Georgia Retail Association. The Hawaii Coalition consists of the Hawaii Food Industry Association, Hawaii Restaurant Association and the Retail Merchants of Hawaii. The Idaho Coalition for Responsible Tobacco Retailing consists of the Idaho Retailers Association, Idaho Wholesale Marketers Association and the Idaho Petroleum Marketers and Convenience Store Association. 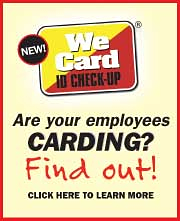 The We Card program is supported bythe Illinois Candy and Tobacco Distributors, Illinois Food Retailers Association, Illinois Petroleum Marketers and Convenience Store Association, Illinois Licensed Beverage Association, and Illinois Retail Merchants Association. The Indiana Coalition for Responsible Tobacco Retailing consists of the Indiana Retail Council, Indiana Smoke Free Alliance, Indiana Petroleum Marketers and Convenience Store Association, Indiana Grocery and Convenience Stores Association, Indiana Wholesale Distributors Association and the Indiana Restaurant and Hospitality Association. The Iowa Coalition for Responsible Tobacco Retailing consists of the Iowa Grocery Industry Association and the Petroleum Marketers and Convenience Stores of Iowa. The Kansas Coalition for Responsible Tobacco Retailing consists of the Petroleum Marketers and Convenience Store Association of Kansas, Retail Grocers Association of Greater Kansas City, Kansas Food Dealers Association, Kansas Retail Council/Kansas Chamber of Commerce and Industry, Kansas Sheriffs Association, Kansas Association of Chiefs of Police, Kansas Peace Officers Association and the Hispanic Chamber of Commerce of Greater Kansas City. The Kentucky Coalition for Responsible Tobacco Retailing consists of the Kentucky Grocers Association & Kentucky Association of Convenience Stores, Kentucky Retail Federation and Kentucky Petroleum Marketers Association. The Louisiana Coalition for Responsible Tobacco Retailing consists of the Louisiana Oil Marketers and Convenience Store Association, Louisiana Association of Wholesalers, and Louisiana Retailers Association. The We Card Program is supported by the Maine Grocers and Food Producers Association, Retail Association of Maine, Inc. and New England Convenience Store Association & Energy Marketers Association. The We Card Program is supported by the Maryland Association of Tobacco & Candy Distributors, Maryland Licensed Beverage Association, Mid-Atlantic Food Dealers Association, Washington, Maryland, Delaware Service Station and Automotive Repair Association, and Maryland Retailers Association. The Michigan Coalition for Responsible Tobacco Retailing consists of the Service Station Dealers Association, Michigan Distributors and Vendors Association Michigan Restaurant Association, Michigan Petroleum Association & Michigan Association of Convenience Stores, Associated Food and Petroleum Dealers of Michigan and the Michigan Retailers Association. The Minnesota Coalition For Responsible Tobacco Retailing consists of Minnesota Grocers Association, Minnesota Petroleum Marketers Asociation, Minnesota Retailers Association, Minnesota Licensed Beverage Association, Minnesota Wholesale Marketers Association, and Minnesota Service Station Association. The We Card Program is supported by the Mississippi Wholesale Distributors Association, Retail Association of Mississippi, and Mississippi Petroleum Marketers & Convenience Stores Association. The Missouri Coalition for Responsible Tobacco Retailing consists of the Missouri Grocers Association, Missouri Petroleum Marketers and Convenience Store Association, Mid-America Grocers, Ozark Empire Grocers, Retail Grocers Association of Greater Kansas City, and Missouri Retailers Association. The Montana Coalition for Responsible Tobacco Retailing consists of Montana Food Distributors Association, Montana Petroleum Marketers and Convenience Store Association, Montana Wholesale Distributors Association, Montana Retail Association, and Montana Tavern Association. The Nebraska Coalition For Responsible Tobacco Retailing consists of Nebraska Grocery Industry Association, Nebraska Petroleum Marketers and Convenience Store Association and the Nebraska Retail Federation. The Nevada Coalition for Responsible Tobacco Retailing consists of the Nevada Association of Tobacco and Candy Wholesalers, Nevada Petroleum Marketers and Convenience Store Association, and Retail Association of Nevada. The New Hampshire Coalition for Responsible Tobacco Retailing consists of the New Hampshire Grocers Association, and the New England Convenience Store & Energy Marketers Association. The We Card program is supported by the New Jersey Wholesale Marketers Association, New Jersey Food Council, and the New Jersey Retail Merchants Association. The We Card program is supported by the New Mexico Grocers Association, New Mexico Restaurant Association , New Mexico Petroleum Marketers Association and the New Mexico Retail Association. The New York Coalition for Responsible Tobacco Retailing consists of the Empire State Petroleum Association, New York Association of Convenience Stores, Food Industry Alliance of New York State, New York State Association of Wholesale Maketers & Distributors/Tobacco and Candy Distributors, and Empire State Restaurant and Tavern Association. The North Carolina Coalition for Responsible Tobacco Retailing consists of the North Carolina Association of Convenience Stores, North Carolina Retail Merchants Association, North Carolina Petroleum Marketers Association, and North Carolina Wholesalers Association. The North Dakota Coalition for Responsible Tobacco Retailing consists of the North Dakota Grocers Association, North Dakota Retail Association, North Dakota Petroleum Marketers Association and the North Dakota Hospitality Association. The Ohio Coalition for Responsible Tobacco Retailing consists of the Ohio Association of Convenience Stores, Ohio Council of Retail Merchants, Ohio Grocers Association, Ohio Petroleum Retailers and Repair Association, Ohio Petroleum Council, Ohio Wholesale Marketers Association and the Ohio Petroleum Marketers and Convenience Store Association. The Oklahoma Coalition for Responsible Tobacco Retailing consists of the Oklahoma Grocers Association, Oklahoma Retail Merchants Association, and the Oklahoma Petroleum Marketers/Convenience Store Association. The Pennsylvania Coalition for Responsible Tobacco Retailing consists of the Pennsylvania Food Merchants Association, Pennsylvania Distributors Association, Pennsylvania Petroleum Marketers & Convenience Store Association, Pennsylvania Restaurant & Lodging Association and the Pennsylvania Retailers Association. The Rhode Island Coalition for Responsible Tobacco Retailing consists of the New England Convenience Store & Energy Marketers Association, Rhode Island Food Dealers Association, Rhode Island Hospitality and Tourism Association and the Rhode Island Liquor Stores Association. The South Dakota Coalition For Responsible Tobacco Retailing consists of South Dakota Retailers Association, South Dakota Petroleum and Propane Marketers Association/South Dakota Association of Convenience Stores, South Dakota Liquor Dealers Association, and South Dakota Association of Cooperatives. The Tennessee Coalition For Responsible Tobacco Retailing consists of the Tennessee Farm Bureau Federation, Tennessee Grocers and Convenience Store Association, Tennessee Fuel & Convenience Store Association and the Tennessee Retail Association. The We Card Program is supported by the Texas Food & Fuel Association, and Texas Retailers Association. The We Card Program is supported by the Utah Food Industry Association, Utah Retail Merchants Association and the Utah Petroleum Marketers and Retailers Association. The We Card program is supported by the New England Convenience Stroe & Energy Marketers Association, and Vermont Retail and Grocers Association. The Virginia Coalition for Responsible Tobacco Retailing consists of the Virginia Gasoline Marketers Council / Convenience Store Council, Virginia Petroleum, Convenience and Grocery Association,Virginia Retail Merchants Association, The Virgina Smoke Free Association, and Richmond Retail Merchants. The Washington Coalition for Responsible Tobacco Retailing consists of the Washington Oil Marketers Association, Washington Food Industry, Washington Retail Association, and Washington State Korean-American Grocers Association. The Washington, D.C. Coalition for Responsible Retailing consists of the Washington, Maryland, Delaware Service Station and Automotive Repair Association. The West Virginia Coalition for Responsible Tobacco Retailing consists of the West Virginia Retailers Association, West Virginia Wholesalers Association, and West Virginia Oil Marketers and Grocers Association. The We Card program consists of the Wisconsin Merchants Federation, Wisconsin Petroleum Marketers and Convenience Store Association, Tavern League of Wisconsin, Wisconsin Grocers Association, Wisconsin Restaurant Association and Wisconsin Association of Distributors. The Wyoming Coalition for Responsible Tobacco Retailing consists of the Rocky Mountain Food Industry Association, Colorado/Wyoming Petroleum Marketers and Convenience Store Association, Wyoming Retail Merchants Association, and the Wyoming Wholesalers and Coin Operators Association.